The importance of trust, and the dis-ease within oneself and within ones relationships when trust is absent has been on my mind for a while. Trust is one of those invisible things that pervades all our relationships, from that with our partner to an interaction with a shop keeper – trust between people is vital, and life without trust is a grim, lonely destructive existence. Nobody can trust an addict, least of all him- or herself. I think we have all heard that quote; its so common that I didn’t bother to look for a source. It certainly resonates with me. When I was drinking I couldn’t trust myself – to behave well, to remember what I had said, to be up on time, to be reliable. Whats more, my kids couldn’t trust me either – not to fall asleep drunk, not to forget to make their dinner: They couldn’t RELY on me to be consistent. And consistency is really important for small kids – it gives then security ….And if you think about it , its pretty important for all of us ? Its important to know that if you do or say X you will get a consistent response from your boss, or from the law or from your partner … Inconsistency creates insecurity. And insecurity is not a good place to build solid family or intimate relationships. When I think about love – and the relationships we have with those we are closest to, it is often said that you cant really love another until you love yourself. I would add that until you can trust yourself – your decisions, your judgement, you cant really TRUST another person either. Until you really know WHO you are, what YOU believe in, what your values are, how can you truly believe that you have made a good choice of partner? And to help a relationship flourish you have to believe in it – to take the rough with the smooth, without wanting to bale out every time the going gets a bit tough. This is a slow process, and I know that this post, like my thinking around this topic is far from ordered and crystal clear, but I think its touching something very important that I need to understand about myself. I touched on the issue of self belief in an earlier post – I think I have failed in previous attempts to stop drinking because I didn’t believe that I could do it – I didn’t TRUST myself enough. 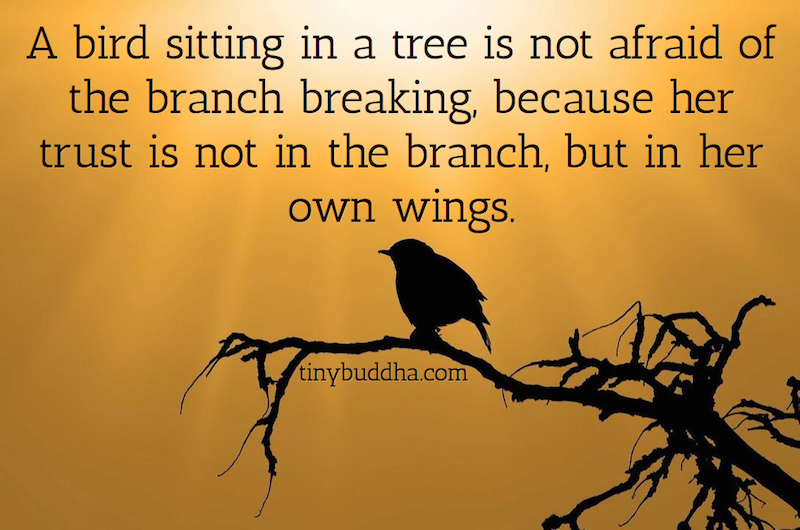 Now, like that bird in the picture at the top of this page I am going to trust in the power of my “wings” to keep me sober, not the strength of any tree….. I think it was my lack of trust in myself that made me finally stop drinking. I couldn’t understand how I could continuously hurt myself, be unreliable, etc. Why I was so weak. Why is was so broken. Sobriety has restored my faith in me. It has taken a long time. This is my year to truly listen to my heart. All those things you wrote. Me too. I know I don’t have to be that person again. I like what Anne said! And I like myself now that I am sober. I am not perfect, not even close, but I know now, I am a good person.